DAC Racing’s team principal and driver Guido Cappellini has asked Tomaso Polli to replace him in Poliform at the Grand Prix of Sanya in China at the end of this month. ‘This will happen until there will be the same conditions for everybody, and I am referring in particular to propellers. After the unanimous decision taken by all teams during last meeting in Dubai [December 28th 2012], our decision has been neglected and now by rules we can’t start on the same technical level. The planned move from forged to cast propellers and to a new single supplier will come into full force in 2014. In the interim period teams can opt to use theirs or existing Five Axis propellers or old forged Hering propellers, and will be limited to three sets per boat. The decision by Cappellini sees Polli back behind the wheel of a Class 1 for the first time since he raced alongside Luca Nicolini in Dubai in 2011, to partner Giampaolo Montavoci, one of the most experienced throttlemen on the tour with 101 Grand Prix starts under his belt. 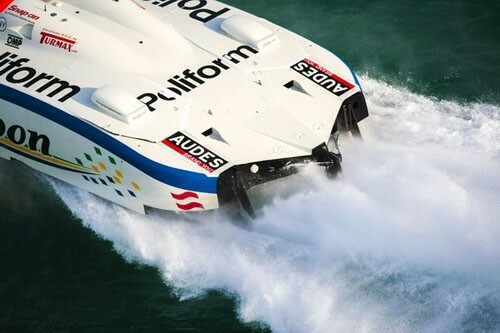 The 37-year-old from Varese, Italy, who lives and works in London as a Yacht Broker for Edmiston, made his Class 1 debut aged 22 at the Italian Grand Prix in Bari in 1998, will start his 27th Grand Prix in Sanya.